in yoga, one of my favorite poses is warrior one. start in downward dog, then lift up your leg and swing it forwards between your hands. tighten your abs, press back into your back heel, ground through your feet and strengthen your thighs, and lift. it's a pose in which i feel strong, powerful, accomplished, and beautiful. last year, a fantastic yoga teacher added this to my description: "your back heel should be extending back, to create a long line in your back leg. at the same time, your hips should be working towards being squared to the front of the room." how is this possible? to me these seemed like two competing ideologies... your leg should extend back, while your hip pulls forward to square with the other hip towards the front of the room. is my leg supposed to be made of rubber? no, actually, i soon realized that this idea is a core one in yoga. when you sit in half-lotus (or cross-legged), your sit bones should be grounding down into your mat while the top of your head reaches up, lengthening your spine. two competing movements, down & up, or backwards & forwards, at the same time. this creates balance. this creates space. last night, during my first hot power flow class at what will hopefully soon become the studio where i take my yoga teacher training, the teacher explained that these seemingly opposing sensations are what gives us balance. when we sit, if we have too much downward energy we will feel heavy, and our upper bodies will collapse, making it impossible to breathe properly. if we have too much upward energy, we will stop feeling grounded and it will become difficult to stay rooted in poses. this balance brings space into the body, and it is what makes yoga such a wonderful exercise, for body, mind, and spirit. in a marathon text session yesterday with my newly engaged best friend (we frequently have whole conversations via text messages), i mentioned to her that i try to take one step every day (no matter how small) towards my ideal life. yesterday, my one step was checking out this new studio (and thank you very much to her for joining me - she is one brave and heat-enduring gal!) ...but at the same time, while i am always working towards my bliss, i also make an effort every day to feel happy with the way my life is at this moment, and to enjoy the time that is passing right in front of me, right now. i realized this is the same as what i've been working on in my yoga class - finding that balance between looking forward and being here now. perhaps at times it feels like i'm pulling myself in two different directions, like there is no way to resolve the fact that i want to change my life and make it better with the thought that i should be happy with where i'm at right now... but that is the beauty of the balance. this balance is necessary to experience joy in my life now, and also joy in anticipation of what's to come. in time, it will elongate and bring space into my life and my heart, and bring me to a place where my present happiness meets my future fantasies. how do you manage the balance between where you're at now and where you want to be? ps, this photo is from the movie "man on wire." have you seen it? 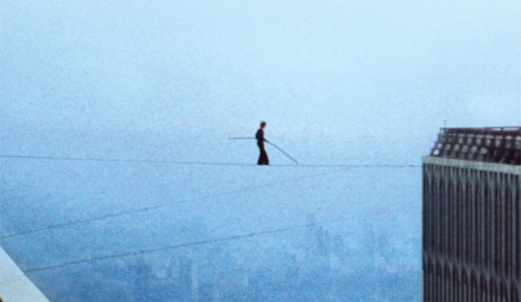 and rig up this tightrope for philippe petit to walk across.